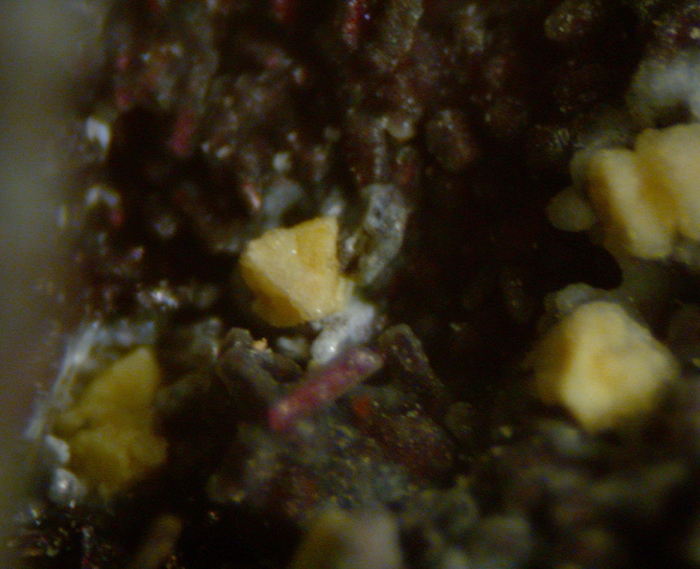 Jeanbandyite: Mineral information, data and localities. Honouring Mrs. Jean Bandy (1900-1991), who donated to the Los Angeles Natural History Museum the collection on one of whose specimens this new mineral was discovered. Stottite Group. Jeanbandyite and natanite represent the only hydroxide-bearing minerals with dominant Fe and Sn. 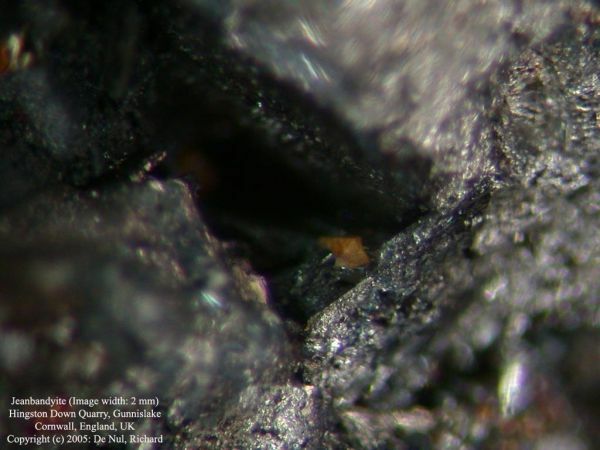 Oxidised counterpart of natanite with partially deprotonated oxygen sites. Double perovskite of BB'(OH)6 type. The deprotonated domains have local short-range order. A dark violet and hard mineral of the (Fe,Mn)(Sn,Ge)(OH)6 composition is reported as "Mineral D" and the Sn-analogue of stottite, from Tsumeb, Namibia (Geier & Ottemann, 1970). 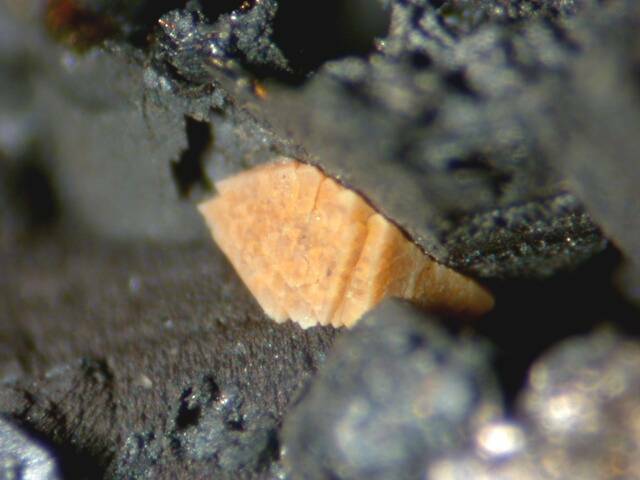 Telescoped hydrothermal tin mineralization in a highly altered acid igneous stock. Crandallite 3 photos of Jeanbandyite associated with Crandallite on mindat.org. Wickmanite 3 photos of Jeanbandyite associated with Wickmanite on mindat.org. Stannite 3 photos of Jeanbandyite associated with Stannite on mindat.org. Pyrite 3 photos of Jeanbandyite associated with Pyrite on mindat.org. Wolframite 2 photos of Jeanbandyite associated with Wolframite on mindat.org. Arsenopyrite 1 photo of Jeanbandyite associated with Arsenopyrite on mindat.org. Scorodite 1 photo of Jeanbandyite associated with Scorodite on mindat.org. Geier, B.H., Ottemann, J. (1970) New secondary tin-germanium and primary tungsten-(molybdenum, vanadium-) germanium minerals from the Tsumeb ore-deposit. Neues Jahrb. Mineral. Abhandl. : 114: 89-107. Fleischer, M. (1971) New mineral names. American Mineralogist: 56: 1487-1489. Llallagua, Bolivia. Mineralogical Record: 13: 235-239. The following Jeanbandyite specimens are currently listed for sale on minfind.com. Specimens collected by David Moulding and now in the collection of D. H. Ifold. Betterton, J. (2000) Famous Mineral Localities: Penberthy Croft Mine, St. Hilary, Cornwall, England. UK Journal of Mines & Minerals, 20, 7-37. [] Betterton, J., Green, D.I., Jewson, C., Spratt, J., Tandy, P. (1998) The composition and structure of jeanbandyite and natanite. Mineralogical Magazine, 62:5, 707-712.